What Slingshots Are Used For? Over the years, we have seen some tremendous advances in not only technology but the way in which we operate. For example, advanced mechanisms are allowing for more efficient guns and bows are now producing more weight and speed after being fired than ever before. However, one of the most useful pieces of kit still remains and it has hardly changed in decades – the slingshot. Today, we have compiled a list of uses for your slingshot! When people buy a slingshot for hunting, they most likely will use it as a supplemental item to their main hunting gear. While hunting, the main piece of equipment is likely to be is a compound bow. However, there will be occasions where you need to be smaller and quieter. When you pull out a bow, it will attract attention. The noise of firing can even scare off all the other prey. After pulling the slingshot from your pocket, you can remain low to the ground and shoot in silence. Furthermore, there is almost unlimited ammunition with a slingshot so you can stay in the grass without being seen and move around stealthily. Aside from the hunting itself, it can also prove useful in survival situations and serve as one of the must have survival gear items. 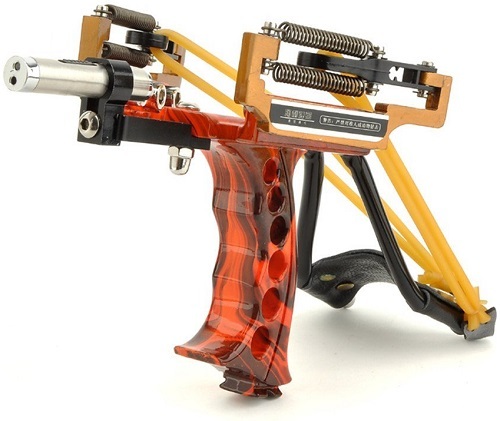 Within just seconds, you could have the slingshot out, loaded, and ready to fire. If you have been practicing and fancy a little competition, you may be able to find a local contest like a hunting or simply hitting targets. As well as having fun, this can be a great way to see how much progress you have made. To add fun, you might even see contests hitting bottles and the like where your aim has to be on top form. Finally, there are also now more people fishing with slingshots. After attaching it to a line so that you can pull in anything you hit, there is a real opportunity to catch fish and whatever else you may find. For example, you could go out into the water on a boat and wait until you see something nearby. When you do, pull out the slingshot and fire. If you hit, you should be able to draw the fish in with the attached wire. If you find regular fishing a little boring but like the rewards, this is the solution for you because it adds an additional skill to the hobby. These are three superb options that you can utilize when it comes to using your slingshot. As long as you practice often, your slingshot shooting accuracy will improve and these hobbies will become more enjoyable.